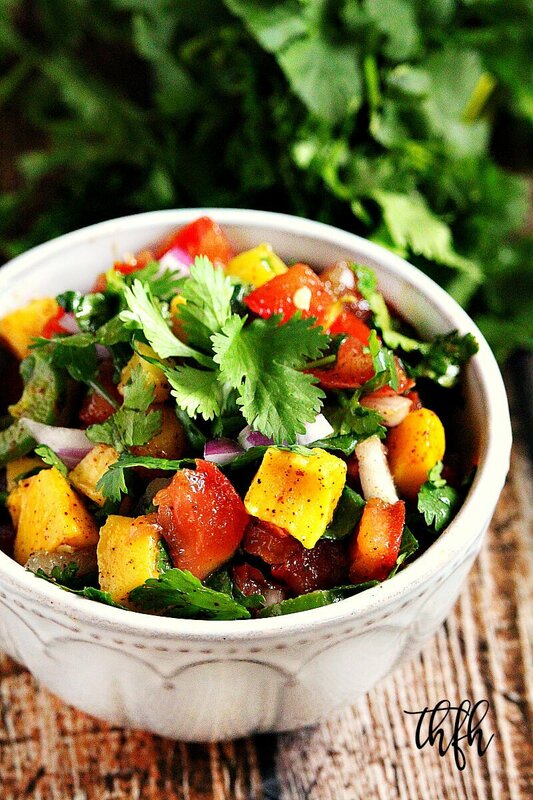 This Spicy Mango and Lime Chunky Salsa is full of fresh flavor and perfect for your summer dishes! I love making different types of salsa with fresh ingredients like this Raw Cilantro Salsa, Spicy Watermelon Salsa, Spicy Balsamic Vinegar Salsa or Raw Tomatillo Salsa. And what’s the best thing about this chunky salsa (besides it tastes really, really good)? No equipment needed to make this recipe…not even a food processor! But you ~could~ use one, or a Vitamix (on pulse mode), if you wanted to and prefer a non-chunky salsa. It’s great to enjoy on it’s own, with some grain-free chips, in a grain-free wrap, romaine lettuce or even in a salad. 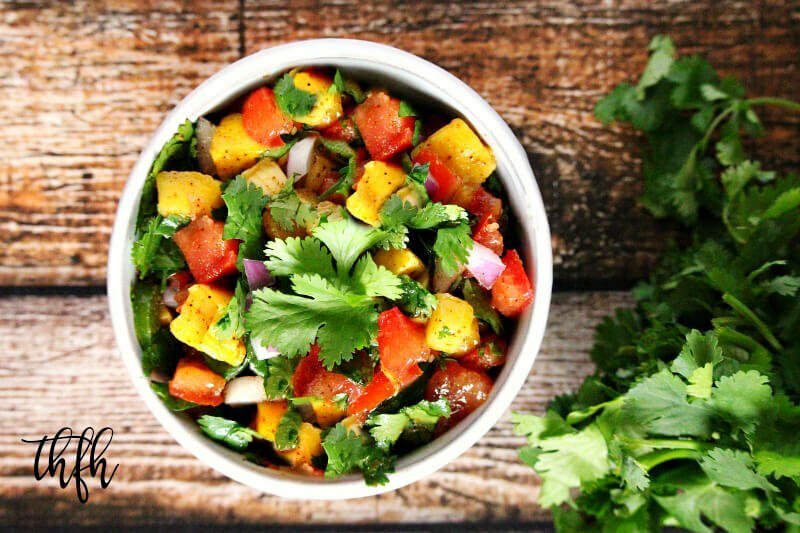 It’s got all the flavors of a traditional salsa, but with a little added sweetness from the mango’s which offset the spiciness. You can have this ready to enjoy in about 5 minutes, or as long as it takes to dice the veggies and mix up the dressing. This healthy recipe is made with clean, real food ingredients and is organic, raw, vegan, gluten-free, dairy-free, nut-free and paleo-friendly. Want more healthy dip and dressing recipes? Check out Tomatillo and Jalapeno Dip, Healthy Artichoke Dip, Raw Spinach and Avocado Dip or my Clean Eating Cookbook with and entire chapter of 20 healthy, clean eating dip and dressing recipes just like this one that you will love! Add all ingredients for the lime dressing to a small bowl and whisk or stir together until it is well combined. Add the the lime dressing to the bowl with the veggies and gently toss until it is evenly distributed. The recipe and photographs for "Spicy Mango and Lime Chunky Salsa" by Karielyn Tillman of The Healthy Family and Home website are licensed under a Creative Commons Attribution Non-Commercial No Derivatives 4.0 International License and cannot be used without my written permission.